Kovalam & Kanyakumari Tour package in Kerala . Book the best kerala tour packages now!! Home Tour Kovalam & Kanyakumari Tour package in Kerala . Book the best kerala tour packages now!! The state is away from all the frenzies of the world, resting in its own original state, giving its visitor a perfect example of natural beauty, round the year. This package of 3 nights and 4 days includes the Kovalam- the internationally renowned beach destination. sightseeing of Trivandrum. Kanyakumari an important pilgrim centre of India, is famous for the Amman Temples – a symbol of unity and sanctity – dedicated to the virgin Goddess, Kanyakumari. Welcome to God s Own Country, on arrival at Trivandrum proceed to Kanyakumari. Reach & check-in at the hotel and relax for a while amidst the comforts of your room. Kanyakumari an important pilgrim centre of India, is famous for the Amman Temples – a symbol of unity and sanctity – dedicated to the virgin Goddess, Kanyakumari. 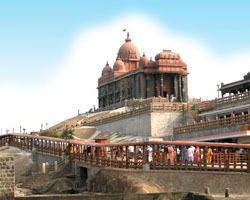 To its South – East lies the famous Vivekananda Rock Memorial, Mahatma Gandhi Memorial ,Thiruvalluvar Statue the memorial statue of Thiruvalluvar is in Kanyakumari Explore the rest of the day at your own leisure. Overnight stay at the Hotel/Resort. Enjoy the sumptuous breakfast. Later pack your baggages with a promise to return once again to this part of the world.... Proceed on time to board your flight/train with sweet memories of your holidays. We await for your next visit... Bon Voyage. Service ends.